Update: The poll is now closed, and you can see the results below! Join us next week for the next step in our community-created samurai's journey. Welcome to the latest installment of the Legend of the Five Rings: The Card Game Create-a-Card series! 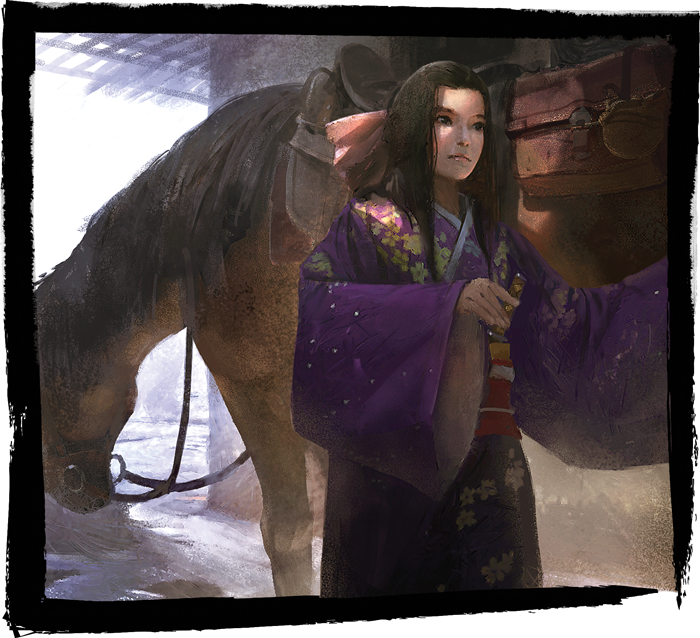 Every week, the Legend of the Five Rings community votes on a different aspect of the character, with the finished card appearing in a future expansion for Legend of the Five Rings: The Card Game! Last week, over 2,000 fans cast their vote for the general ability of our Unicorn samurai. With 28% of the votes, a theme of Out-of-Clan allies emerged victorious! We're going to define exactly what that means in a few weeks, but in the meantime, we'll continue to further mechanically define our character by determining their skill and glory values. Read on for an explanation of how these stats will be determined, and cast your vote at the bottom of this article! The options presented today won’t be exact numbers, but instead a general idea of how our character’s skills will be divided. For example, a character with an “extreme military focus” will have exceptional military skill, but very low political skill. However, a character with “balanced skills” has moderate military and political skill with a more even spread between them. A character with a political or military focus falls somewhere in between these options, slightly favoring one skill over the other. You will also determine the character's glory, matching “medium” or “high” glory with the above stat spreads. 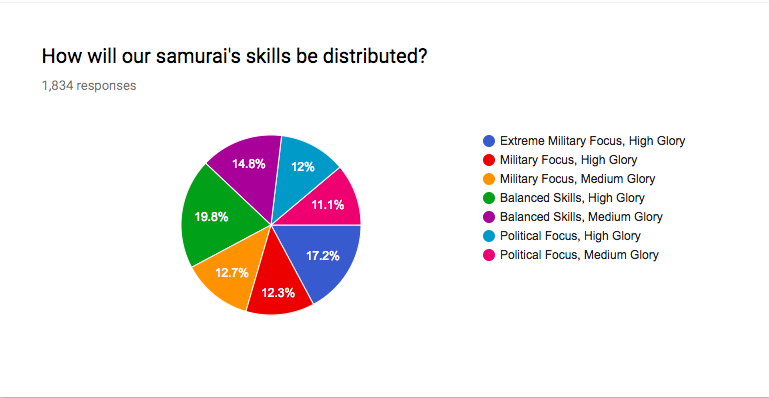 Again, these are more abstract values to determine the range of our samurai’s glory—the exact values for skills and glory will be determined during final development and playtesting! What went into presenting these options for our samurai's skills and glory? It had been previously determined that our samurai is a member of the Utaku family. Because this is the family that most embraces the honor and traditions of Rokugan in the Unicorn Clan, a low glory skill will not be an option in this vote. Furthermore, the military might of the Utaku helps define them as a family, and those that excel on the battlefield are often entrenched in honor and glory. Thus, a character with an extreme military focus can only have a high glory value, and an extreme political focus will not be an option. Consider your choice carefully, and cast your vote below. But make your voice heard quickly, the poll will only be open for 24 hours! Our samurai is beginning to take shape. We’ve already determined their general ability, but now we must decide what conflicts they will excel in. 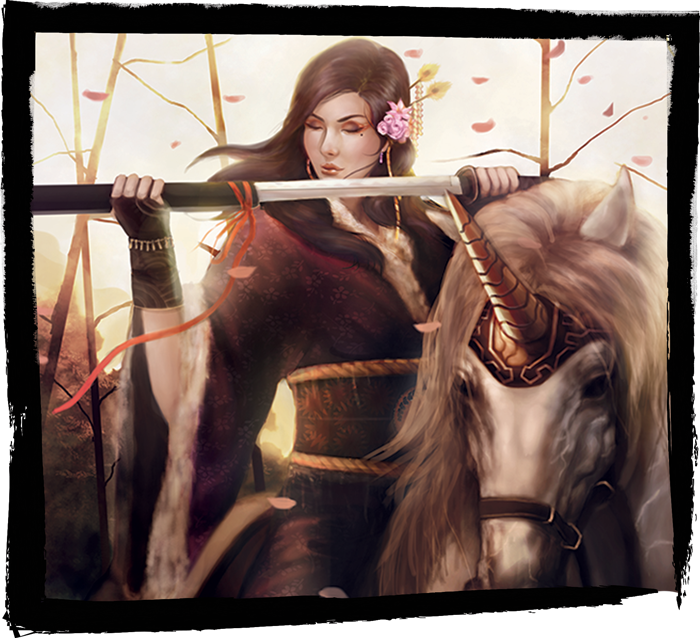 Wil our samurai be a fierce warrior who brings glory to the Unicorn, a shrewd courtier, or something in between? The choice is up to you! Join us next week as we continue to define our samurai’s role in the world of Rokugan!